I spent most of the last Sunday wandering in the woods gathering the new soft annual shoots of spruce. These can be eaten as such, used to make tea or to make syrup. In this post I’ll explain my motives for making syrup instead of buying it and also share the recipe with you. If you live in Finland or on the same latitude you still got at least a week or so to enjoy the fresh spruce tips. Give them a try! 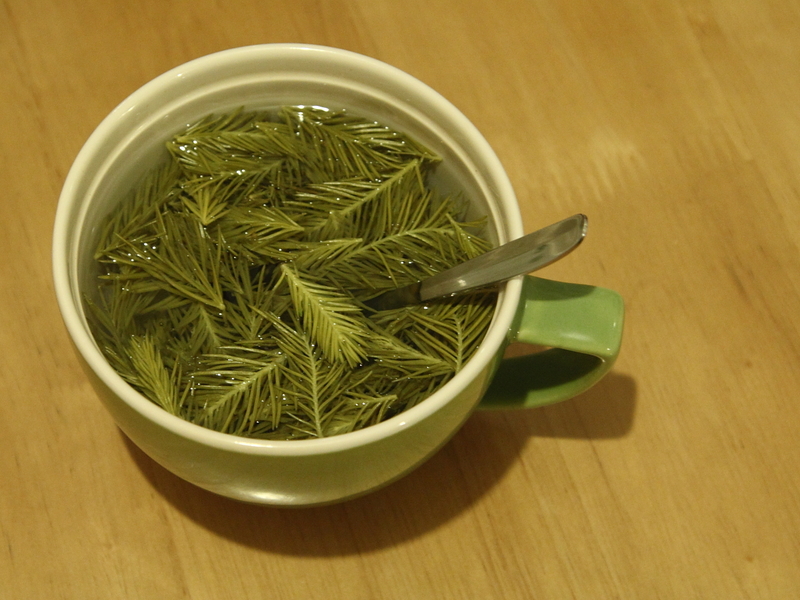 Spruce tip tea with honey. I haven’t written much about my background or motives in my blog but in addition to recreational outdoor sports I’m also interested in bushcrafty things and the basic skills of living of the land. I don’t see this as a hobby and I don’t feel like it needs a special name like “bushcraft” or similar. For me it’s about the skills and ways of living that our ancestors have utilized not-so-long-ago here in the forests of the North. Ways, that from my perspective seem quite sustainable, simple and satisfying. And for me it’s also about combining them to the best parts of modern way of life to seek out something satisfying. As a kid I spent quite a lot of time with my grandmother gathering berries and mushrooms and at least equal amount of time fishing and hunting with my father. I think that the foundations of my close relationship with nature come all the way from my childhood experiences. There was a period in my life when I wasn’t too interested in these things (even though I still enjoyed outdoors in other ways). But for a some time now my interest in these lifestyle things has been growing again. Even though living of the land in the Christopher McCandless style would be cool, I don’t think it would make a sustained way of living – at least not for me. Instead, I dream about changing part of the modern “work to earn money to buy food” cycle in the more traditional “work to get your own food” way of living. I believe that in this way I could keep up a decent standard of living with less work in the office and being able to spent more time in the nature. And the process of living of the land is also very satisfying: it’s a “hands on work” closely related to nature and also directly connected to your own well-being. And I happen to like it! As I said, I spent Sunday mostly in the forest gathering spruce tips. The weather was great and even a typical forest of Southern Finland can be interesting if you slow down your pace and stop to wonder the little things along the way. For example while I was gathering the tips from one small spruce it sounded like it was raining. But clearly it wasn’t raining as the sun was shining, the skies were bright blue and I didn’t feel any drops hitting me. After some time I noticed huge amounts of ants skittering on the ground on top of dead dry leafs. The tiny ants made a sound similar to rain drops hitting leafs around you! And there I stood listening the little creatures making a sound reaching my ears a few meter away. If that isn’t wonderful then what is? Maybe some day I can spend most of my days in the nature and wonder all the things little and small – and still make an even more satisfying living. 1) Start by gathering new soft spruce tips, preferably one to seven centimeters long. You need about three times as much spruce tips in volume as you want to have syrup (so three liters of spruce tips makes about one liter of syrup). I gathered about six liters of tips and got a bit under two liters of syrup. 2) Rinse the spruce tips with cold water. 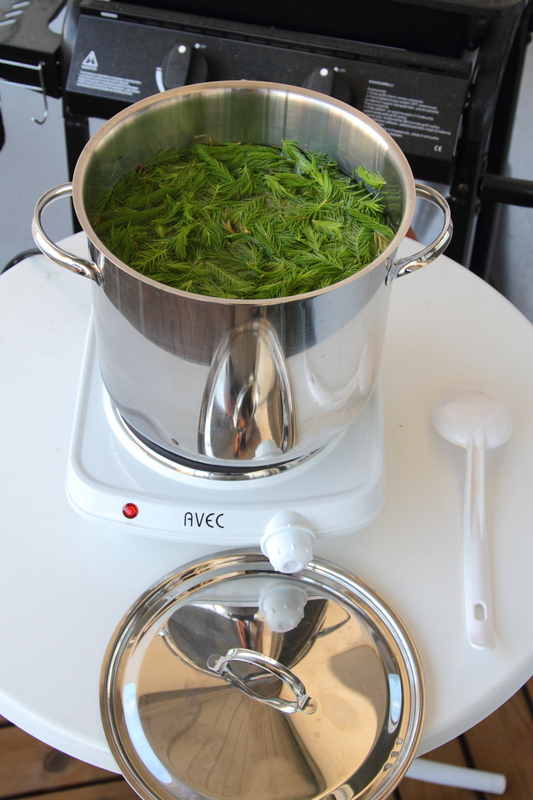 3) Place the spruce tips into a big cooking pot, add enough cold water to barely cover the tips (notice that they float, so don’t add too much water) and let them soak overnight. 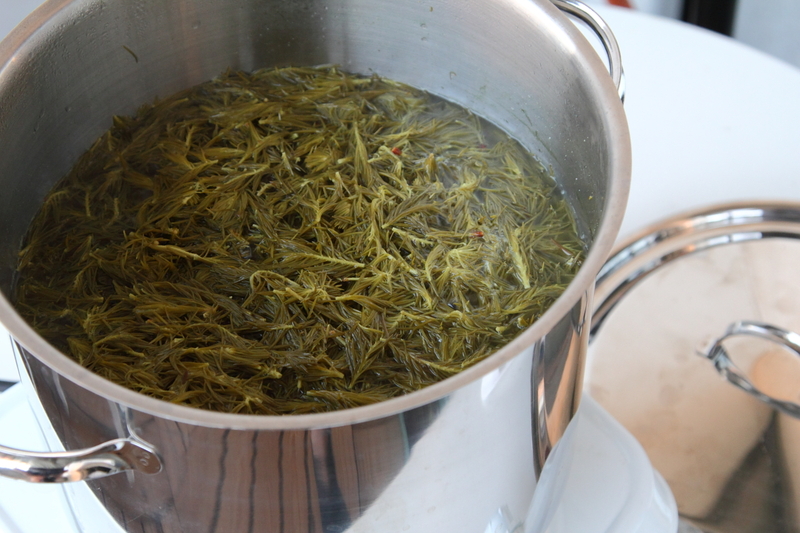 4) After soaking the tips, put the pot on a stove (or on cooking fire) and let it boil gently for about two hours. It’s good to use slightly over sized steel pot with thick bottom. Spruce tips after about two hours cooking. 5) Filter the tips away and spare the liquid. I used a colander for first round of filtering and then removed the last small particles with colander lined with cotton veil. (Ultra light life style tip: the same veil makes also a good towel. Way better and cheaper than the microfiber ones sold in sports stores.) I guess you could eat the left-over spruce tip mush but I threw it away. 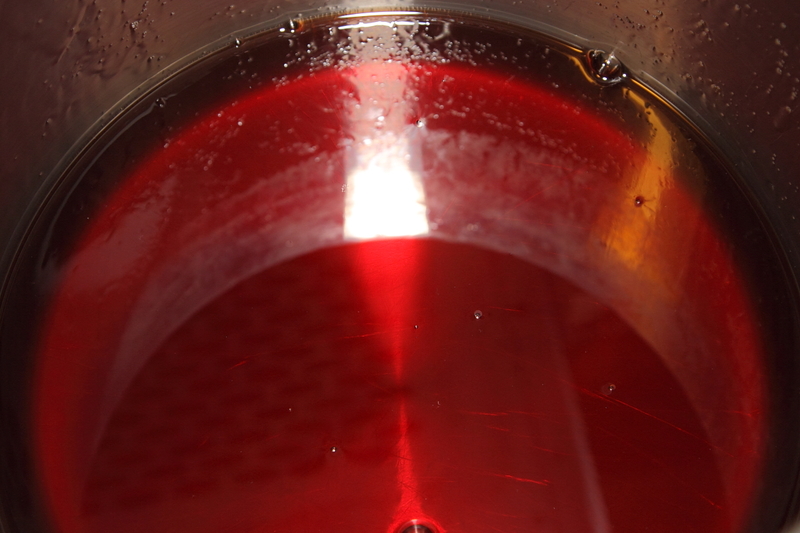 5) Add sugar to the filtered liquid. The right amount is about 0,5kg per one liter of liquid. If you would use less sugar and boiled it down for longer time, you could probably make smaller amount of syrup but with more intense taste. The syrup after about two hours of cooking. 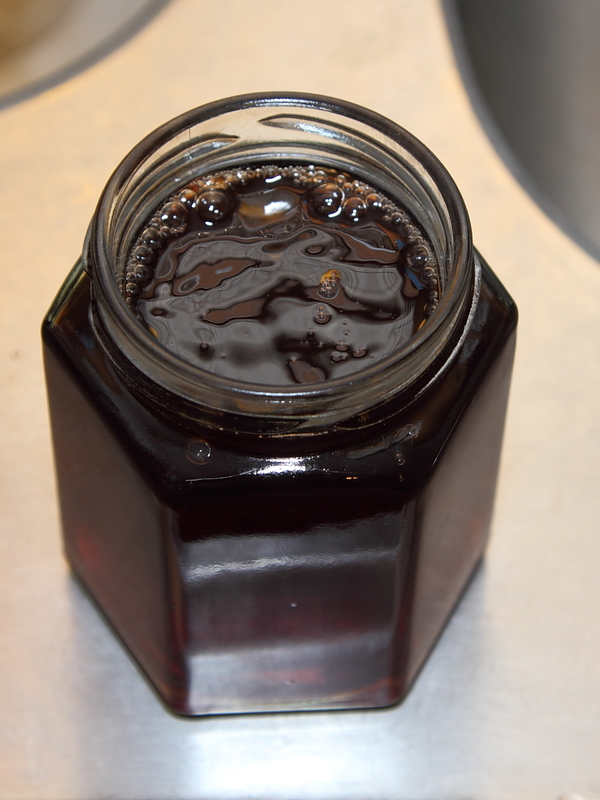 7) Pour the hot syrup into clean and treated glass bottles (for thinner stuff) or glass jars (for thicker stuff). 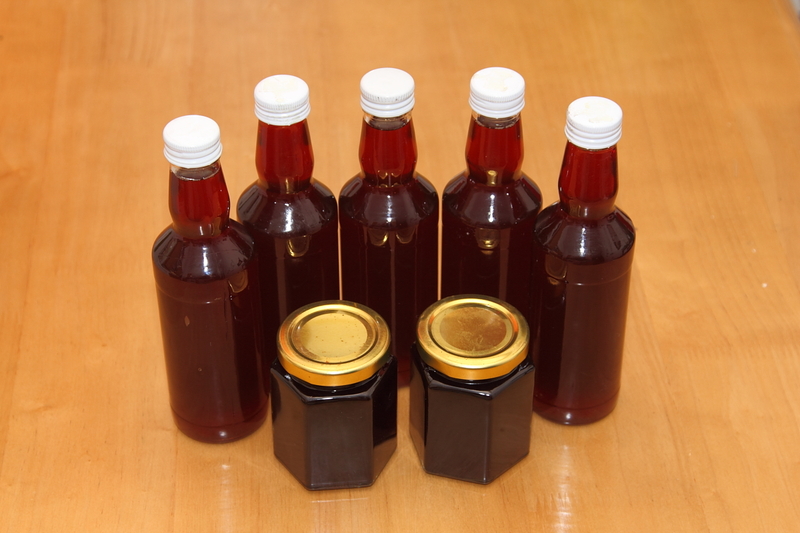 It is good idea to place the bottles and jars into hot oven to kill all the germs before pouring the syrup in them. 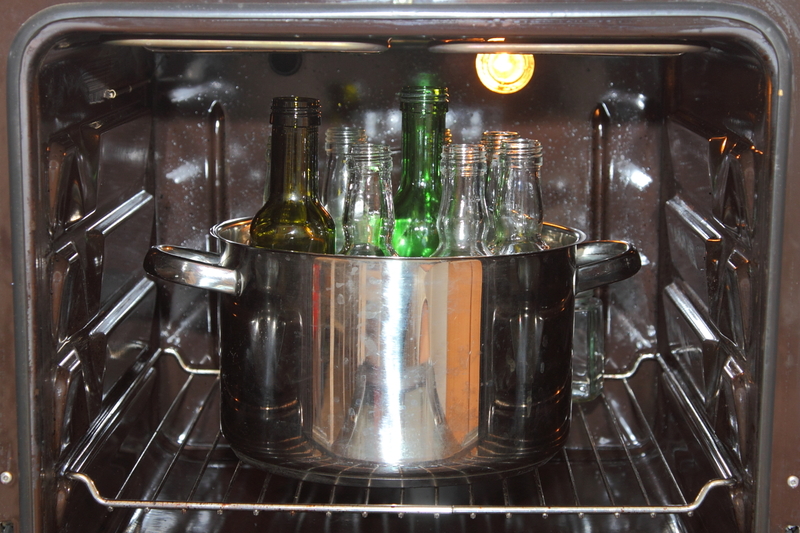 I put my bottles in an oven with 150 Celsius for 30 minutes. Fill the vessels to the brim with hot syrup and close immediately. I kept the syrup on simmer while doing this: pouring boiling syrup into 150 Celsius glass bottles and sealing them immediately when the boiling stopped. This way there should be no change for bacteria to get into the bottles. A pair of leather gloves comes handy at this stage. Heat treating the bottles in 150 Celsius oven before bottling the syrup. Hot syrup still boiling in the heat-treated jar. I waited for the boiling to stop, filled the vessels to the brim and sealed immediately. 8 ) Preserve the bottles in cold place protected from sunlight. Because of high sugar content of the syrup and heat treating the syrup should last long – if you can resist consuming it immediately. Enjoy during the long and dark winter months! My little treasure for the winter to come… Notice that the hot syrup has shrinked in volume while cooling creating a vacuum inside the vessels first filled to the brim. Remember that gathering spruce tips is NOT EVERY MAN’S RIGHT in Finland and you need to have the land owners permission to gather them! I thought it would be nice to share some info about the syrup I made a year ago: I didn’t use much of it as I spent a lot of time away from home (at the Wilderness Guide School, on trips and on the practical working period in the North) so most of the syrup spent the winter in a cellar. Unfortunately the bottles didn’t seal as well as I wished and even though the caps were air tight (still vacuum inside the bottles while opening) there was some mould growing inside and I ditched the contents. The little jars worked as assumed and the syrup was still fresh and usable. So, jars is what I recommend. You could also just run the bottles through a dishwasher – the heat from drying them in that will sterilise them – another tip from the homebrewing. I don’t have a dishwasher, though occasionally I wish I had! But that’s a good tip for others who might give this a try. I had a delicious rye lager in Helsinki last year, and would love to make one. I have made a few Sahti’s though – http://www.brewingtv.com/episodes/2010/11/17/brewing-tv-episode-24-sahti-throwdown.html – with varying degrees of success. Thanks for the link! Interesting stuff. I don’t like Sahti that much, at least the commercial version occasionally available. But rye lager sounds quite like something! Hmm… Where could I get some of that… It’s sunny summer day with +26 Celsius in the shade and a cold lager would be really welcome indeed! Spruce tip syrup is new to me, but I’ve eaten birch sap syrup and it is great. You are right in that only a few generations back in time, a lot more food was used from the nature and it is a tradition that should be nurtured. The tradition of gathering and preserving fruits, berries and mushroom still lives in Finland. It is not pursued by everyone, but still important. I don’t think it makes sense economically, though. E.g. blueberry jam is very cheap to buy, but takes a while to pick and make to jam. Of course, by making it yourself you can make sure that there is actually blueberries in the blueberry jam. And going out to pick mushroom or berries is a great excuse for going out in the nature (though no such excuse should be needed). But I learned a completely different process for this cough syrup: layers spruce tips (up to 1cm long) and sugar in a big jar, close it with cellophane and let it the sun until autumn. The spruce tips will be red and swimming above the syrup. Filter and put in a bottle, keep in the dark and cool. I think this is so concentrated in essence and sugar that nothing can live inside. This year I made already elder syrup, have still to try elder pancakes! Sabi: Great minds think alike. I really like the idea of doing something directly related to my well being. That syrup making process is interesting! Was the cough syrup thick and syrup like or more like really sweet liquid? I’ve heard people making cough medicine in the same way but using alcohol instead of water, and adding sugar for taste. I think that the basic idea behind most of the preserving methods is to get rid of the “free water” usabale for bacteria (i.e. drying, using a lot of sugar, etc.) or using something poisenous enough (i.e. alcohol, lot of salt, etc.) to kill the bacteria. I noticed the new tips on the spruce trips on my last couple of trips. And now I know what to do with them next year! The forester’s sweet martini sounds delicious and refreshing. I have been wanting to make this again for years but had lost the recipe given to me by a German blacksmith! I remember it being very good…a friend called it “pine honey”! Other recipes online seem to be very quick and give you a thin syrup, so THANKS!! I will be making some next June! It’s always nice to help people, especially in things like this (i.e. connecting to nature). Enjoy your syrup! 🙂 I’ll be doing a new patch again next June. Excellent post. I found myself checking continuously this great site and I’m impressed! 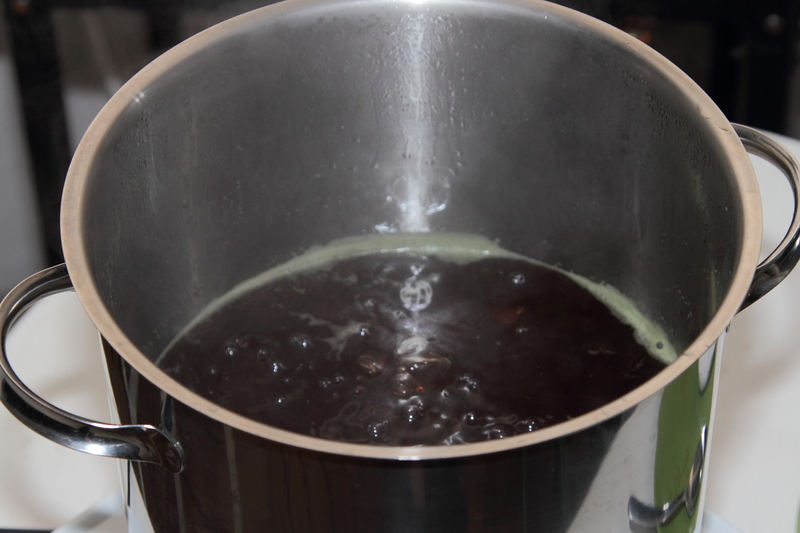 You could water bath process this, as you would for berry syrup of jam, and it will probably keep for years! I made it last year, but I cooked it down too far, and had trouble getting it out of the jar! Will not make the same mistake this next year.